The museum is 30 minutes from the centre of town. Get out at Darüşşafaka, the penultimate stop, with a shorter escalator exit than Hacıosman, and take a taxi (5/10 mins). The nearest ferry station is Sarıyer. There is a convenient 8.15 boat from Beşiktaş, which gets in an hour later. Have breakfast at the Liseliler Café in the waterside in front of the museum. The death of Sevgi Gönül, the Sadberk Hanım’s driving force, sent Turkey’s finest museum into shock (wrote John Carswell). But her nephew Ömer Koç took the helm. A collector of stature, particularly of rare books, he invested his new role with enthusiasm. The museum, in a 19th-century house built in a Swiss vein, has late Ottoman costumes, important Iznik and Kütahya pottery and Chinese porcelain. It has also a prized collection of antiquities. The exhibitions drawing on the museum’s massive collections are unmissable. 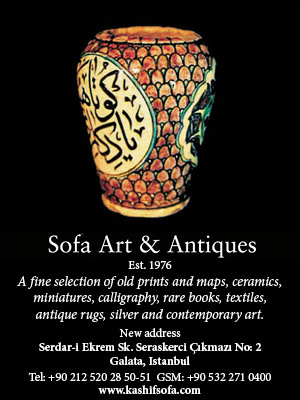 Sadberk Hanım Museum is a Cornucopia Stockist – get your copy of the latest issue here.